Old St. Andrews Old St Andrews. 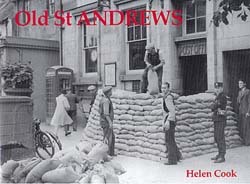 The St Andrews Preservation Trust gave us access to their fantastic archives for this book, and the pictures are accompanied by Helen Cook's excellent narrative. Although to the outsider St Andrews may appear to have changed little, these photographs reveal that this is not the case. Past events such as car and motorcycle racing on the West Sands, and a poignant picture of evacuee children arriving at the station are just a couple of the subjects featured. There's extensive coverage of the Fishergate and those that lived there, as well as life around the harbour and the old Step Rock bathing pool. This is a really attractive book featuring a very wide range of photographs.